The skinny on Santa: How to tell your kids the truth about Santa Claus. When I was pregnant with Devin, I got into a big argument with my then sister-in-law about my plan to have Santa Claus be a part of Devin’s Christmas seasons. She told me that I was being a liar and setting a bad example for my child. She told me that Devin would resent me and have trust issues once the truth came to light. I said that while she was free to tell her daughter anything she wanted, we would believe in Santa at our house, and thank you in advance for respecting our wishes… She told me that she would not lie to her nephew (my child) and could not guarantee that she would keep our secret. Anyway, she never spilled the beans, but I always worried that she would. Most people choose to let their kids believe in Santa Claus, and there is always that awkward time when they realize they must either tell their kids the truth, or let the playground rumors do their job for them. When to come clean about Santa is a difficult decision. Since it is almost the Season, and for some people this question will soon be upon them, I thought I’d share our method of breaking the news. I think it works pretty well. Let me start by saying that our family has always maintained that Santa is a part of the celebration of the birth of Baby Jesus. Santa is not the reason for the season, but we incorporate him as part of the spirit of giving. Why does Santa have Mom’s handwriting? We’re all Santa, and now that our bigger boys know Santa’s real form… now they are Santa too. Our kids didn’t feel lied to, they felt like they were now in the club. I have to say that they each embraced the spirit of Christmas more than they ever had before. They loved that they were creating a little magic for their younger siblings. Once the boys knew that they were Santa, they loved the act of surreptitiously dropping little presents into stockings. They love the idea of helping to create the magic and to preserve it for the younger kids.. They love the idea of Christmas much, much more as the givers than they ever did as the receivers of those little gifts. … and isn’t that what it’s all supposed to be about anyway? That is what Christmas is all about. What beautiful memories you are creating for your boys!! What ARE you saying? There’s no such thing as SANTA! I am calling my parents tonight! That is a great way to “let them know”. I think I denied that there was no Santa until I was 15- didn’t want to stop getting gifts!!!!! 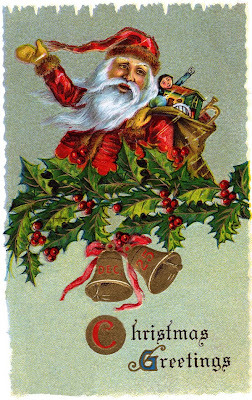 And for the record the legend of Santa Clause was based on a real man St. Nicholas aka Sinter Klaas in the original Dutch). You are dead on right with what you told your kids! It drives me crazy when people claim they are “lying” to their kids. In our family, if you don’t believe in Santa, then you don’t get a gift from him. We use one paper for Santa gifts and other wrapping paper for everything else. My husband’s family does not do Santa (Wisconsin Synod Lutherans). Something about one God…I dunno. Anyhoo, I tried explaining to him that as a child that’s how I believe I gained a sense of a “santa-like” God. I never mixed them up but, I believe it has greatly affected my faith in the unseen. So, I love God…God is god! And, I also believe in Santa. This is what I love about Christmas….the magic. We have elves too and I need to get busy finding things for them to do and bring. I was in the 3rd grade when I asked my mom if Santa was real. (I’d heard things at school.) She told me to go to my room and think about if I really wanted to know & then come back. I came back and she told me it was her. I was like ok. I knew all along (writing, wrapping, ect.) but I just wanted her to tell me. PS We still get one (expensive) gift from Santa. Therefore, I have to believe! lol. I think that is a great way to break the Santa news. We haven’t had to do that yet since all of mine still believe so I may borrow some of your ideas! And I personally do not know one single adult that has trust issues because Santa turned out to be mom & dad. They might have issues for other reasons…but not Santa. I learned about Santa due to Mom’s writting as well. I though it was funny but no trust issues. Maybe she was the one who ahd them? My oldest learn from his cousin but was OK when I explained it better to him. He is looking forward to help make some magic for his little brother. We believe in Santa Too. Mainly b/c Santa is in all of us. He helps foster dreams and imagination. He does a good deed that makes everyone happy. I am glad he is part of me. I wish more people had a little more Santa in them. What a great post! I never thought of that; the part about Santa being real, but in a different form. I think I’ll be doing that now. How cool! I love this idea! My oldest daughter is 7 so I know its only a matter of time before this comes up and I love how you “break” it to them! Okay, this is a fabulous idea! I’ve been dreading the “come clean” day for a long time, and now I think I may look forward to it. Thank you! Well, your ex-SIL better be glad that she doesn’t celebrate Christmas with us, becuase she wouldn’t be getting any presents! My Granny’s rule is that if you don’t believe, you don’t receive! I love how you tell your kids that we all have a little Santa inside…that’s a nice way to pass on the giving spirit. Very sweet story. We did something very similar when the eldest started having questions. She loved being “in on it” and was never tempted to blow it for her younger sister. CRAZY ex-sister-in-law. I love that idea of Santa. I may use it! I totally remember wondering why Sant’s wrapping paper was the same as ours! That’s why we have special “Santa paper” that is only used on Santa’s gifts. Love your idea of “breaking it” to them! We’re into the grandkids now – and I know the day is coming soon when one asks – 8 & 5. Our way was just to say, well as long as you believe in the “magic” of Santa and Christmas, Santa will always be real and to my 36 and 28 year olds, there’s still a Santa who brings stuff in the stockings, but we’ve always had presents under the tree from Mom and Dad. Santa only brought stuff in the living room that didn’t get wrapped. This will be the first year I don’t put out cookies and Coke – hmmmm. 5 year old lived with us til this year. That’s gonna be a letdown and may be something I do anyway, just part of the tradition.